Part 1: A basic overview of the most well-known, least controversial aspects of galaxies - their sizes and morphologies, the different environments they inhabit and the different process that are at work there. Part 2 : A look at how observations are used to tell us what we know about galaxies, with a practical introduction to optical photometry and HI spectroscopy. Part 3 : The statistical philosophy of why we interpret observations in a certain way, with an introduction to galaxy formation and evolutionary theory. Why correlation doesn't equal causation, why objectivity is not always a good thing, and why a model that works really, really well doesn't mean there aren't other models that do even better. Part 4 : The current controversies in the field. Is the dark matter paragidm in crisis, or are all the problems on the cusp of resolution ? I present my own, unashamedly biased view, and give links to alternative interpretations. I've given public talks in Prague for the Astronomical Institute open day in November 2014 ("Why the Night Sky is Really Boring and How To Fix It") and for the Czech Astronomy Olympiad in July 2017 ("The Hunt For Missing Galaxies : Batman, Explosions, and Jodie Foster Impressions"). These talks are not currently online in any form although eventually I might try something. 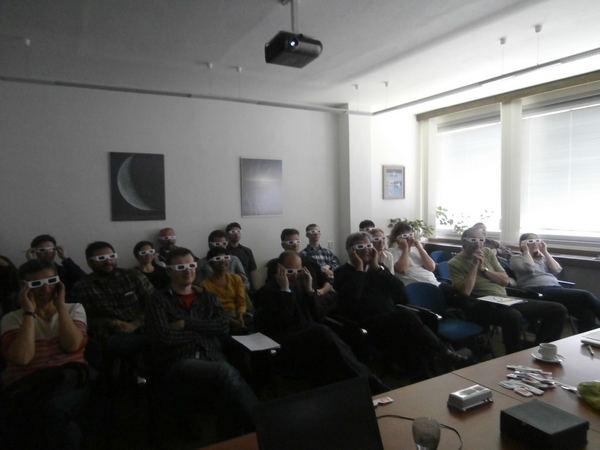 I'd love to give more public talks, but this is qutie hard in the Czech Republic where most events should be in Czech. 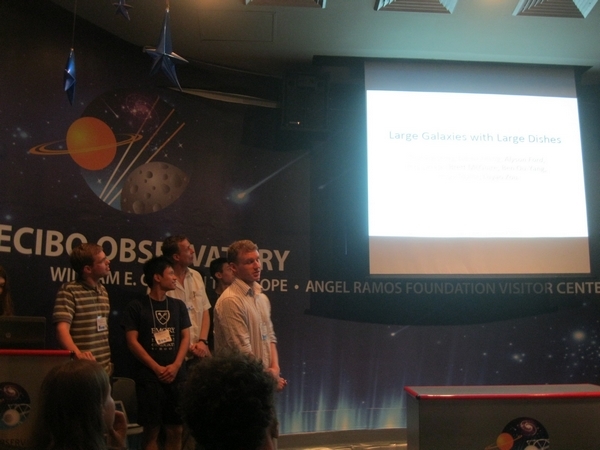 While I've also supervised week-long projects at Green Bank (West Virginia) and Ondrejov (Czech Republic), my main experience at project supervision comes from the Arecibo summer Research Experience for Undegraduates program, which was an absolute hoot. Basically you find a dozen or so of the finest undergraduates money can buy and stick them on a tropical island for ten weeks. First they get blasted by a week of non-stop lectures, then they spend the rest of the summer learning directly from a researcher how to do real, practical research. Even if they're working with old data, all the students get to use the telescope at least once, and often much more. 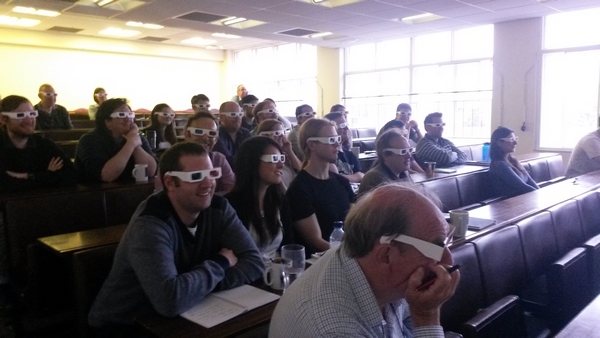 From the researchers' point of view, the REU programme is intense. Undegraduates usually have little background knowledge about what they'll be studying, and often zero knowledge of the practical day-to-day tools they'll be using. This means the supervision can easily take up 100% of a researcher's time. And no-one minds, because it's fun. While I was at Arecibo I supervised three students over three summers (one the first year, two the second - one of whom returned for the third year) in conjunction with Robert Minchin. There were also numerous hands-on observing projects run especially for AGES, featuring undergraduates who weren't involved in the project al all as well as visiting high-school students. I also remotely supervised two of our REU students who wanted to continue their project as part of a research for credit module. For the Single Dish Summer Schools at Arecibo and Green Bank, I supervised small groups of PhD students who performed min-research projects with Arecibo. In the space of a week, they pick some targets to observe, create the observation files, learn how to use the telescope, reduce the data as it comes in, measure the parameters of their detections and do some basic analysis. It's frickin' mental when you think about it. I do not believe talks to scientists and the general public need be all that different, so I go to great lengths to try and make seminars as entertaining as I think I can get away with. The talk has evolved from a 15 minute version ("AGES : Science With an Expensive Paperweight;" AGES : Science Without An Expensive Paperwight - Damn EasyJet ! "; "2 Years In The Jungle : The Accomplishments And Goals Of A Welsh Astronomer At Arecibo") to a full 50 minute seminar ("AGES : Science With a Lonely Smurf And A Talking Moose"). It includes a disco data cube (though no dancing as yet) and a dozen movies, three of which are in 3D. Which is great because then you get to see a bunch of very intelligent people looking very silly. As far as outreach goes, you can find examples of my outreach visuals here and a compliation of some of my write-ups here and here. I've also supervised an undegraduate Fortran 90 course, marked scripts, answered questions from high-school students at AAS events, and participated in outreach activittes for the general public for the Herschel space telescope at the Royal Society.